The writers of “Good Will Hunting” have not worked together on too many projects since their debut as screenwriters for the Oscar-winning film. In the interim, the best friends have achieved plenty during their solo careers as award-winning actors, directors and writers. This week, however, the best friends were spotted in Santa Monica attending a business meeting for a new joint venture that they are working on. Affleck and Damon are teaming up once again on a film about infamous Boston mobster James “Whitey” Bulger, the leader of the Winter Hill Gang who was arrested this past June. 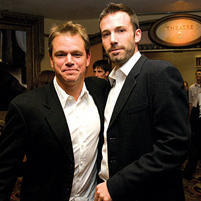 Matt Damon will star as the brutal mobster and Casey Affleck (Ben Affleck’s younger brother) will play Bulger’s brother, Billy. Ben Affleck will serve as director of the project. News of the project began circulating earlier this year as Ben Affleck worked to conclude his latest box office success, “Argo” (see our review HERE). Ben Affleck has directed three highly-successful films, including “Argo,” but this latest venture may see some competition in another film in production with the same subject matter. “Twilight” star Peter Facinelli is currently rumored to be producing a Bulger film starring another Bean Town alum, Mark Wahlberg. What are your thoughts on Damon and Affleck teaming up for another film about their beloved city? Follow Cherry Bell Damasco-Farrington on Twitter at https://twitter.com/cbdamasco.